We only have nine business days left in the Session, and as such, the pace at the Capitol has increased significantly. I am working hard to be well-informed about all pending legislation. At this point in the Legislative Session, it is easy for bad bills and amendments to sneak by. It is important that you stay involved and let legislators and the Governor know about your concerns. During the last few days of the session, I will be reviewing all my messages, but probably won't have much time to respond. Please review the information at the end of this message on the best ways to contact me. I am the primary sponsor of HB 269, Identity Theft Provisions, which passed the House with a unanimous vote. This legislation increases penalties for those higher up the supply chain of identity theft, who have mass quantities of identification materials. Under HB 269, it will be a second-degree felony if an individual possesses, sells, or transfers any information necessary for the use of 100 or more financial transaction cards or identifying information with the intent to defraud or with the knowledge that someone else will use the information to defraud. Just as law treats distribution of drugs more seriously than simple possession, it should treat these mass identity harvesters of account and identification information more seriously than unlawful possession of one ID. HB 269 will be debated in the Senate Business and Labor Committee in their meeting on Monday, February 26th beginning at 8:00 a.m.
HB148, sponsored by Representative Tim Quinn, removes the 1.75% state sales tax on food. In order to compensate for the lost revenue, the bill raises the sales tax on all other products from 4.7% to 4.92%. Utah is one of only a few states that continues to tax food. Food is an essential item. Taxing it creates an undue burden on low income families. This bill passed the House after much debate, with a vote of 42-27-6. I supported this bill. 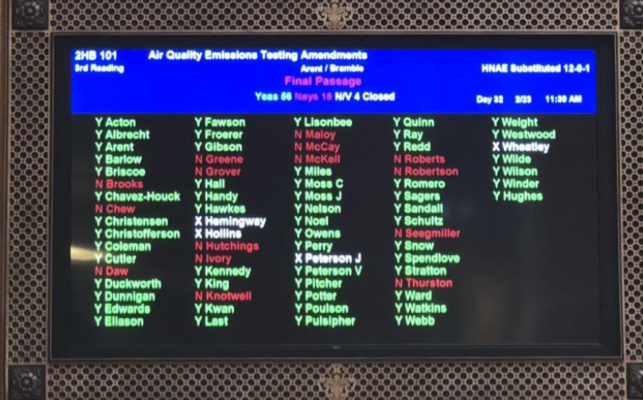 I am the Chief Sponsor of HB 101, which is an important piece of clean air legislation. The bill passed the House with a vote of 56-15-4. HB 269 focuses on reducing diesel vehicle emissions. It sets up a three-year pilot program for all nonattainment counties that test gasoline vehicles and are not testing diesel vehicle emissions. Currently, four of these five counties require both gasoline and diesel emissions testing. The county participating in the pilot program will have reporting requirements and the Division of Air Quality will provide analysis. HB 101 will be debated in the Senate Judiciary, Law Enforcement and Criminal Justice Committee on Monday, February 26th in their meeting beginning at 4:00 p.m. This legislation prohibits the state from seeking the death penalty for aggravated murder committed before May 8, 2018, unless the state filed the notice of intent to seek the death penalty before May 8, 2018. It also prohibits the state from seeking the death penalty for aggravated murder committed after May 7, 2018. HB 148, sponsored by Rep. Gage Froerer, passed the House Law Enforcement and Criminal Justice Committee with a vote of 7-4 and will next be considered by the full House. I support this legislation. On Thursday I had the opportunity to see the work of two talented young artists in my district. Allison Sink and Bailey Willes are both students from Olympus High School who won Honorable Mention in the prestigious 46th Annual Utah All-State High School Art Show. I had the opportunity to meet with Allison, but unfortunately, Bailey was not able to come to the Capitol that day. Below you can find pictures of their beautiful art and a photo of Allison sitting with me on the House floor. Mayor Jeff Silvestrini, who lead the pledge on Feb. 21st, Rep. Arent, and her son Josh Lipman, who gave the prayer. epresentative Arent and students from Crestview Elementary 4th Grade. Another 4th Grade class from Crestview also visited the Capitol, but unfortunately we did not get a photo of that group. I may only have time to respond to messages that are personalized and are not template emails. I read form emails, but may not have time to respond if it is the same email as those sent by others. If you come to the Capitol, I will try my best to come out to talk to you. It is my job to represent HD36 in debates and I take that position seriously. It can be difficult to leave the House Chambers or a committee meeting if we are debating an important bill. Be sure to put your email address and phone number on your "green slip" request so I can follow up with you if I can't make my way out to the House lobby. So you will know, sometimes it takes 15 minutes for those notes to get to me. It is truly an honor for me to represent HD 36. I look forward to hearing from you throughout the rest of the session.